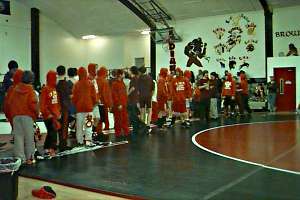 All of those boys in red advanced to represent the Utterly-Backward Middle School in today's divisional wrestling meet at Fort Benton. See ya there! We had a winner in yesterday's contest; of course, it was a "Mini-Mate" lunch box/cooler. We're working on a Fabulous Prize; hey, maybe a ticket to the divisional!